Vijaysingh Madhavji Merchant pronunciation (helpinfo), real name Vijay Madhavji Thakersey (12 October 1911 – 27 October 1987) was an Indian cricketer. A right-hand batter and occasional right-arm medium pace bowler, Merchant played first class cricket for Bombay cricket team as well as 10 Test matches for India between 1929 and 1951. Behind his limited Test appearances, he dominated Indian domestic cricket – his batting average of 71.64 is the second highest first class average in history, behind only that of Don Bradman. He is regarded as the founder of the Bombay School of Batsmanship, that placed more importance on right technique, steely temperament, and conservative approach rather than free flow of the bat, a tradition broken and remoulded only after the arrival of Sachin Tendulkar. His international career included two tours of England upon which he scored over 800 runs. English cricketer CB Fry exclaimed “Let us paint him white and take him with us to Australia as an opener.” His brother, Uday, also played first-class cricket. Merchant was born in Bombay, into a wealthy family in 1911. He was an “outstanding college cricketer” who captained Sydenham College, Bombay while studying there; his success for Sydenham led to selection for Hindus cricket team during the 1929 Bombay Quadrangular. He also continued to play for Sydenham and in 1931 he set the record in Bombay inter-collegiate cricket by scoring 504 runs and taking 29 wickets. His continued success in domestic cricket resulted in the call to the Indian cricket team to play against the visiting English team at Bombay Gymkhana, which was also the first Test to be played on Indian soil. Throughout his career, Merchant was involved in a rivalry with the other great Indian batsman of the era, Vijay Hazare. In the Bombay Pentangular match against the Rest, he bested Hazare’s record of 242, set just in the previous match against the Muslims, with 250 not out. Hazare responded with a 309 out of a team total of 387 in the next innings, in what is generally held the greatest innings ever played in India before 1947. Merchant topped it by scoring 359 against Maharashtra in Ranji trophy. Merchant’s Test career spanned 18 years but during that time he played only ten Test matches, and was unfortunate that some of the best years of his career were lost to the Second World War, when no international cricket was played. He also missed tours to Australia and the West Indies due to poor health. However, Merchant went out to score 154 in his last Test match against England in Delhi, which was also his highest Test score. A shoulder injury incurred while fielding in that game forced him to retire. All ten matches of Merchant’s Test career were against England. He went on to become a cricket administrator, broadcaster, writer and national selector, and charitable advocate of the handicapped. “Cricket with Vijay Merchant” was a radio programme hosted by Indian cricketer Vijay Merchant It was broadcast on Sunday afternoons, on Vividh Bharati, Anu D. Aggarwal quotes a survey, which revealed that it was one of the most listened to sponsored programmes. Although Vijay Merchant played only ten test matches, he is widely considered to be one of the greatest batmen of his era. He was an attractive stroke maker, who “developed fine footwork, and built a stroke repertoire featuring a lovely cut, grasscutting drives, a delicate glance and late-cut, and, until later in his career, a brilliant hook stroke.” His batting average in first-class cricket was 71.64, putting him second only to Don Bradman of Australia. In India’s domestic Ranji Trophy matches, he fared even better, averaging 98.75 in 47 innings. His record is especially impressive as his runs came at a time of uncovered wickets. Merchant was one of the five Wisden Cricketers of the Year in 1937. 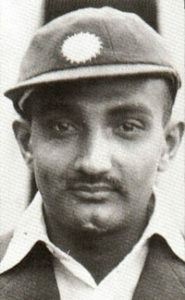 Vijay Merchant is also the oldest Indian player to score a test century. He scored 154 when he was 40 years 21 days in India vs England match in 1951-52 series.